I’m a really, really big fan of this series (even though I–ugh!–still haven’t read the first book). I’ve become invested in the characters, in the Mann brothers, their girlfriends, and their whole group of friends, so of course I jumped at the chance to read this latest book in the series! Shatter is the fourth book in the True Believers series (which I highly recommend) and while I wouldn’t say it’s my favorite, I still had such a fun time reading it. 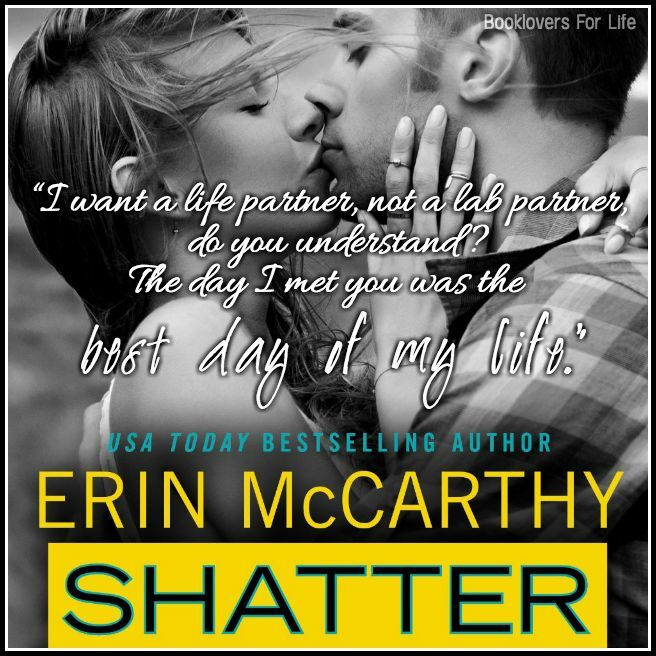 Shatter was cute, quirky, and had me smiling and giggling so much! We know from Believe that Kylie’s boyfriend cheated on her… with her best friend. She’s normally a cheerful, glass-half-full kind of girl, but she’s heartbroken at the beginning of the book. Thankfully, Kylie has a distraction in the form of a hot chemistry tutor named Darwin, aka Jonathon. The two are a bit awkward but adorable together, and they just click. And there’s definitely some ‘chemistry’ going on between them too. Neither of them intended to fall into bed together, but they did, and their actions are not without consequences… because Kylie gets pregnant. Naturally, Kylie freaks the eff out–she doesn’t know how she can take care of a baby or how Jonathon will react. But Jonathon, the hot, dorky nerd that he is, is actually a really nice guy. He stands by Kylie’s side, but the two of them mutually agree that they won’t be falling in love with each other any time soon. Shatter is told through both Kylie and Jonathon’s POVs, and I was really glad to get both of their perspectives. I liked reading Jonathon’s reactions–he’s a good guy through and through, though he does have his idiot moments. As he and Kylie spend more time together getting ready to have this baby, Jonathon can’t help but fall for the mother of his upcoming child. He’s clearly a very analytical, scientific guy, so seeing him fall in love is just the sweetest. I loved the contrast between Kylie and Jonathon, and how they complemented each other so well. Jonathon is smart and scientific, but he’s never fallen in love until he meets Kylie. Kylie doesn’t think too highly of herself, but being with Jonathon helps her realize that she’s smart in her own ways. These two make the most adorable couple ever! But Jonathon and Kylie don’t have it easy. They go through some very rough, heartbreaking times, and sometimes it seemed as if a happily ever after wasn’t possible. But they eventually try to fight for each other, because even though they never expected the pregnancy, and expected to fall in love even less, they found something beautiful with each other. Kylie and Jonathon are the most adorable thing ever, but I just didn’t love their story. The writing was a bit stilted and off, so I didn’t click with this book as much as I wanted to. I liked the story, and I really liked the characters, but I just didn’t love the book. 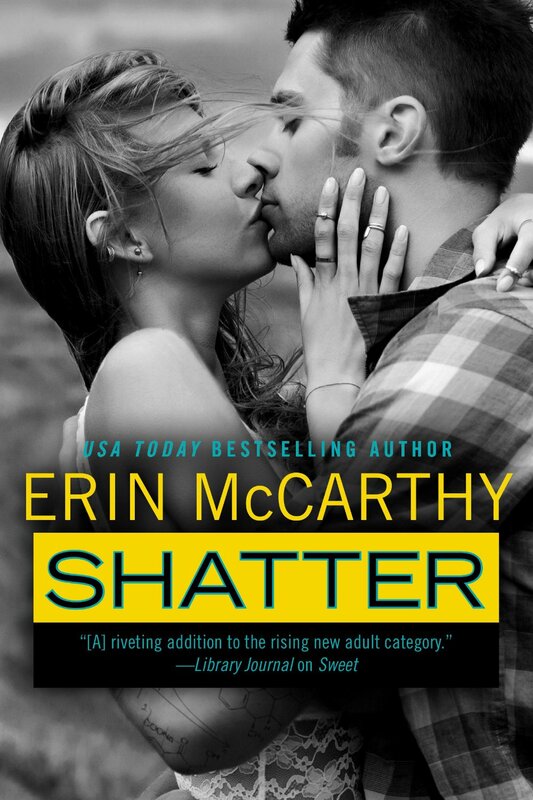 Still, Shatter is an endearing, adorable love story that fans of the series shouldn’t miss.